For some reason I’ve always been a bit intimidated about the idea of doing a roast. I don’t know if its my memory of overcooked grey tough meat from my Nan’s house as a child, or perhaps the era when I was single and roasting a joint of meat was not realistic, nor affordable, that led me to feel this way. A few years back I actually set myself a challenge to improve my roasting skills and with some valuable tips going a long way to making me a successful roaster, I thought it was time for me to share some of the lessons. I know I’ve spoken before about the importance of having a good butcher if you’re going to eat meat. The quality of what you’re eating is sure to be better than purchasing from your local supermarket, and you get not only a great product, support a local business and you’ll get qualified help when you need it. Preparation is not only in your seasoning and marinade. I took a leaf out of Neil Perry’s The Food I Love and marinated mine in some apple cider vinegar and a generous rubbing of smoked Viking Salt to begin with. More importantly I removed the joint from the fridge at least an hour before cooking to get it up to room temperature. This helps the muscle to relax and retain its fluid for a juicer roast at the end. In the warmer weather we’re having in Brisbane at the moment I’d much rather be cranking up the BBQ to cook than heating up my house, and I am very fortunate to be able to roast my meat in a Weber BBQ. In fact if you have eaten meat roasted off a coal BBQ then you’re probably unlikely to want to go back to just cooking in the oven. The flavor that is gained from this style of cooking is exceptional whether your roasting some sweet potatoes, a joint of beef, a whole chicken or even just a cob of corn. They can seem time consuming because you have to plan in advance for setting up your coals but the end result far outweighs any inconvenience. If you have the space and patience to operate one of these styles of barbecue I can’t recommend enough the value you can get in giving one a go. 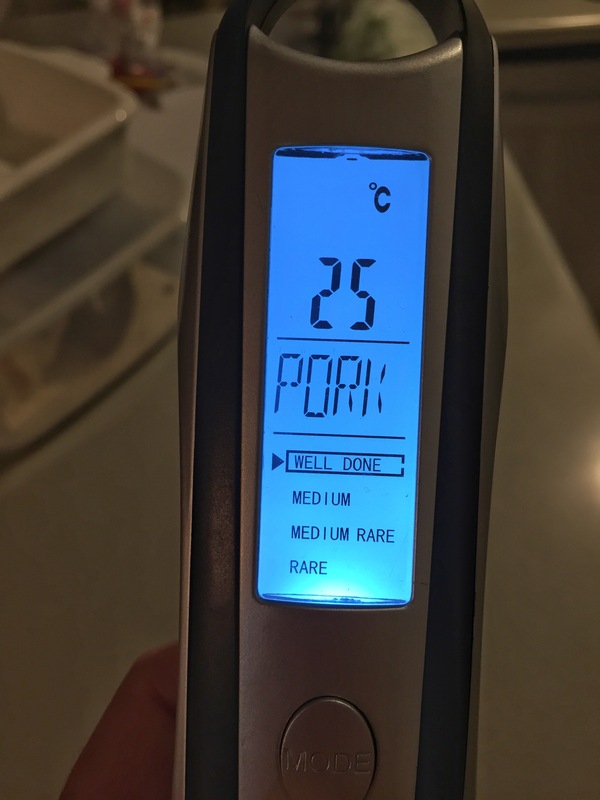 To ensure that I don’t overcook our roast I got given an awesome thermometer which allows me to measure the core temp of the meat. This means no more over or under cooking and is hands down one of the best gadgets I have in my kitchen to help me with roasting meat. Finally before serving, take the time to rest the meat. I removed the roast from the heat a few degrees below the desired end result (75c) as it will keep cooking for a while. I then wrapped it in foil to retain the warmth and allowed it to sit for 15 – 20 minutes. Doing this again allows the muscle to relax and the juices to redistribute themselves through the joint to give you an end result that is a more evenly cooked meat that is flavorful and juicy. And how did our roast shoulder of pork on the bone turn out? The crackling was crispy and light, the pork meat was sweet and juicy, and the accompanied home grown sweet potatoes made for a great feast to celebrate not only our national day, but also an early family birthday. If you’re after more tips on roasting meat I can highly recommend referring to Neil Perry’s book “Food I Love” and definitely talk with your butcher. Don’t have a barbecue but I’ve always been comfortable with roasts. Going by the picture, you seem to have mastered the art. Oh thank you 🙂 I think I’m getting better at it finally. Great tips! Must get one of those nifty meat thermometers.